Toys to life is now a well-worn term in gaming, rising to prominence when Skylanders started to take over the world. Employing simple NFC technology that had long been part of the lives of daily commuters with travel cards, for example, it turned figurines into vital video game accessories - making stacks of cash in the process. The Skylanders series has been hugely lucrative for its publisher, Activision, and Disney has been pitching in with its Infinity series; the latter, though, has struggled to maintain momentum. Nintendo adopted a different approach with amiibo, of course, with the figures working across a host of games on Wii U and 3DS while utilising the New Nintendo 3DS and GamePad, albeit with a portal on the way to support older portable models. The big N's range has been such a success that it's struggled to keep up with demand, of course, and its flexibility has led to third-party involvement and diverse yet often simple features and unlockables. 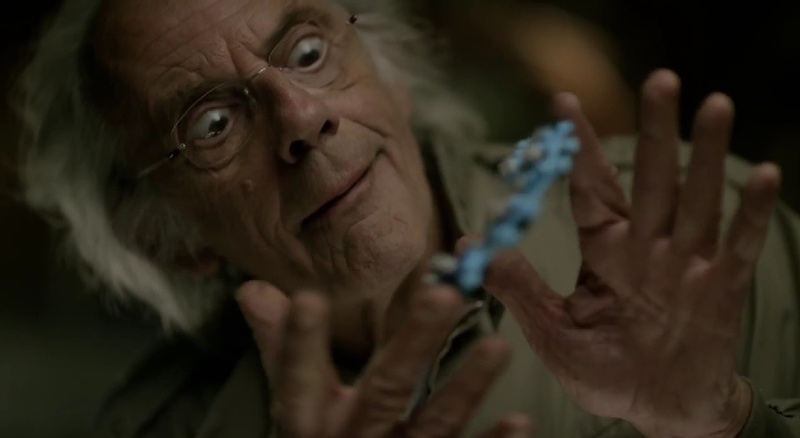 Into this crowded market comes LEGO Dimensions, which is undoubtedly a significant threat to Skylanders and Infinity. LEGO is, after all, the most lucrative toy brand in the world, and is teaming up with the TT Games range of titles that have arrived in impressive numbers over many years. Frankly, it's been surprising that it's taken this long to come to market. Speaking to the game's Associate Producer Mark Warburton at EGX in Birmingham, we asked him to pitch the title and highlight why, in such a fiercely competitive market, Dimensions can succeed. We've got 10 years of experience in LEGO games, LEGO has a lot of experience in toys, and Warner Bros. has the muscle of entertainment behind them, so we just pull all of those ingredients together, mix them up and try to do something special. This has always been an idea that's been fermenting, mixing up characters and brands together. We do building with LEGO all the time when making the games, so why not do that in real life? Kids play with LEGO, of course, and we wanted to blur the lines between physical and digital play. We're working on a review for this on Wii U, but what's striking when simply opening the box is the feeling that we're actually opening a LEGO set rather than a game. That sounds silly after seeing many trailers emphasizing that point, of course, but opening the box to find a hefty instruction booklet and multiple bags full of tiny LEGO pieces drives the point home that this is a little different from its competitors. While amiibo and Infinity toys are solid un-movable figures - with the exception of Game & Watch - and Skylanders has some customisation, LEGO Dimensions requires quite a bit of initial time just to construct the portal and original figures. Warburton was keen to emphasize that the technology behind this isn't as simple as might be expected, while "toys to life" is a term that's more literal when applied to the game. The hardware came along at a level to make it possible. You can have up to 7 characters or vehicles on the portal, put them anywhere. It also registers where the characters are placed on the toy pad so we can make that not just a spawning device but also a sort-of controller as well that feels like it's pulling you into the game. So when you say "toys to life", it does actually feel like you're bringing your LEGO pieces to life. Of course, for all of the buzz that comes with the concept come question marks over its structure and price. The Starter Pack is a little cheaper on Wii U than it is PS4 and Xbox One, for example, but it's still a hefty investment. Then you have the expansions that come with fairly handsome price-tags of their own, cashing in on popular franchises to lure in fans of all ages. We asked for a solid idea of the value these expansions offer, and Warburton naturally emphasized the positives both for those that buy these packs and others that decide it's a cost too far. All of the brands are woven into the main story mode, so if you don't buy the Doctor Who pack, for example, Peter Capaldi's still in the story. For example if you do go out and get the Doctor Who Pack you get a standalone level, which is a sizeable one. You also get an adventure world which is a massive open-world area full of quests, things to do and different characters. There are also hidden areas in the main game that can be accessed with the extra pack's toys. There's still plenty of content if you don't get the extra pack, though. The number we keep coming back to is the Portal pack, as we can say that if you play the Portal level in the game and the pack it's longer than the original Portal game. 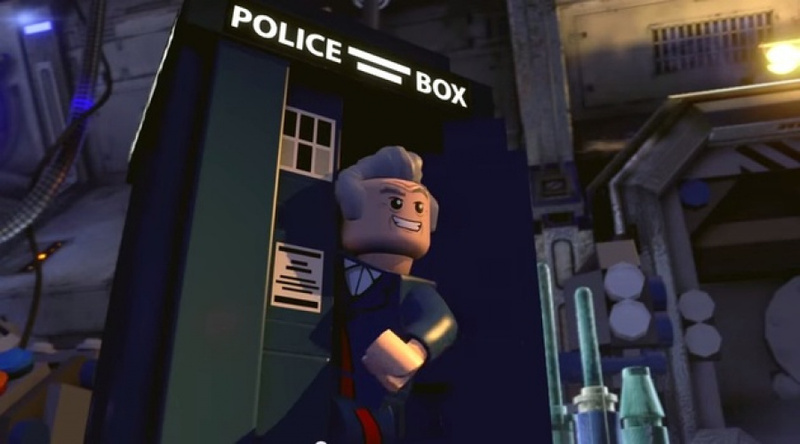 Plus a lot of LEGO games is about replayability, so if you get the Doctor Who pack you can play through the story again with the Doctor, with K9, just as you could previously with Batman and Wyldstyle. The original Portal is actually relatively short, so it looks like a few hours of content is on offer, though it's something we'll explore further. In fairness to Warburton, even in the presence of an attentive Warner Bros. PR supervisor he was keen to re-assure us that the Starter Pack does at least represent a reasonable investment in the 'platform'. The terminology for these toys-to-life brands often references them as systems within systems, especially due to the price, but carefully constructed portals should be useful for a reasonable amount of time. TT Games, at least, is conscious that parents and fans only have finite sums of money to spend on the series. We don't want a new portal, at least for a couple of years. We waited for the technology, that was key for us, so we can keep plugging in new characters and packs to that as we see fit. Toys to life as a whole has a cost factor for entry - I have kids that are probably going to pester me to buy these things. So if you have the starter pack, for years and years to come you can grab a new character and it'll just work, and it'll keep updating on and on so that over time it becomes bigger and bigger. Standalone games "aren't going anywhere"
When looking at Dimensions, with its dozens of LEGO bits, handsome packaging and enough major IPs and franchises to shake a stick at, it's tempting to wonder about the future of all those standalone LEGO games that arrive on a yearly basis. Are they still relevant in the long-term, will they fade away in favour of Dimensions and its ever-expanding range? No, is the simple answer. Evidently sales are still reasonable enough on these games from a Warner Bros. perspective, and from the perspective of TT Games Warburton was keen to say that more of these titles will follow after LEGO Avengers. Intriguingly he was also keen to keep the branches separate when we proposed an amiibo-style solution of multiple tie-ins, with the Dimensions portal and figures interacting with separate standalone LEGO games. It could happen, of course, but the official line is that it's not on the cards right now. The likes of LEGO Avengers and these games aren't going anywhere, we love playing around with these sorts of franchises. Dimensions though is something that, as a company, we feel like we've been building towards for a long time, so we want to give it the push it deserves. We want Dimensions to be a system, in a way, always plugged in and expanding, so we want that to be focused on its own content. There haven't been conversations about pulling in other content. Only time and sales figures will tell the story of whether LEGO Dimensions will take over as the leader in the lucrative toys to life market. It's hard to bet against it, though, through virtue of brand power alone. Combining huge third-party properties with the world's most popular toy range and a continually successful game range seems like a golden ticket, if ever we've seen one. If Nintendo wants to push amiibo further in the future, perhaps a LEGO tie-in as opposed to Skylanders will be the way to go. The HYPE! Won't be able to get this straight away but I love the Lego games and portal 2 was amazing so I have to play the expansion pack! It looks really cool but I think the price tag of the Starter Set will help the competition. But hey, it's Lego we're talking about and everyone knows how popular the brand is. "perhaps a LEGO tie-in as opposed to Skylanders will be the way to go." Bad feeling that K'nex deal does away w/ all of those thoughts. But the idea of a Lego Mushroom Kingdom area sure is appealing. Don't see how this can fail. Yes at currently about $725 for the entire set the price could be described as absurd, bu tI don't think that's going to deter people who probably spend $200 per year anyway on Lego toys, those things ain't cheap you know. Mindstorm is $350. Lego Worlds is a Minecraft clone, Dragon Quest Builders is a Minecraft clone. Nintneod makes the Gamepad and amibo and gives us 2D level editor SMM w/ amiibo skins that only work in 8-bit mode. I would have settled for Ntineod Land 2 this holiday w/ a hub world I could rearrange to my liking and a home builder component like in the Disney INfinity 2 hub so I could give our amiibo a place to live. Anyway, Skylanders is our main family game every holiday, but the more I read abut this the better it looks. Real question will be do the toys go half price Black Friday like the other toys-to-life have over previous years? Even amiibo have had B1G1 sales. Will buy the starter pack the 1st day it hits $50, and figure out the rest from there. All Dr. Who toys will be purchased regardless. Edit: DQC in case anybody is wondering. If that doesn't look like an amiibo Wii U game I don't know what does. Just saw this in stores and realized I won't be buying this anytime soon. $15 for the small sets and $30 for the large ones. I'll have to look at the gameplay because if the levels are like the old Lego games, $15 is way too expensive for just a level. I might pick this up way down the road though, at some discounted prices. Don't see me buying that expensive starter pack but I like the Scooby Doo figurine. The thing with these is that I can just buy a Lego set with Scooby and be done, since I value the collector side more. I want to get this but A) the guy in the game store showed my daughter Frozen characters in Disney Infinity, so my hands are tied B) the cost! and C) The figures seem... little for the price, compared to Amiibo, Skylanders and Infinity figures the Lego Mini-figs seem well mini. This still looks average. I'll just buy the Doctor Who set and won't bother buying the game (if I can even do that). Have the starter set and Wonder Woman fun pack (remember that from being a kid), but probably going to wait for a drop in cost to get any more. It's £30/£15 here so even more expensive than the equivalent in dollars (approx. $45/$22). Already spent £100 so needing prices to drop quickly to maintain my interest. That feels like enough already. Remember when you used to be able to go to the store, buy the entire game on a single cartridge, go home, and play then entire game on a single cartridge? Having got the dark Wii U Skylanders and regular Wii Skylanders, I'll be waiting patiently for a massive price cut (the other ttl games with portals all plummeted in price eventually), which would seem more likely as there's no Wii U special edition. All I'd get is the Dr Who level, but I'd rather just buy it as a download as I don't really wsnt more figures tat. I know why it's not included but if this had Star Wars I might have to get it day one. Will there be enough other franchises to keep my interest I'm not sure but my kids could think up a few. My kids and I are liking this game, even though my wallet isn't. @Aurumonado That was a long time ago. Good times, good times. Imagine for a moment if Nintendo handled Super Smash Bros. with this business model. "you going to need a bigger imagination" AND a bigger wallet because of the starter set(i think about £80-£90 in tesco) and the expansion pack(i think about £20-£30 in tesco)! i was so hype about that game until i saw a price of the starter set and the expansion pack and anyway i was planing to save up for Zenoblade chronicle X Limited Edition and Little Battler eXperience because of robot n stuff! if the game have a price drop, i might get but i should probably buy the doctor who pack and the portal pack first! Lego James Bond. Seems an obvious choice to me. Definitely getting this closer to Xmas when hopefully a sale is on. My problem though is that If I pick it up on Wii U am I going to be in a situation next year where I need to buy again on the next Nintendo console ? I know is a bit crazy to predict so far in advance, but the way they talk about this as 'a platform in a platform' maybe it makes more sense to get it on one that will last a few years. Its tricky as I would always ideally have a game like this on my Nintendo console. My only NFC toys are amiibo period. Lego Worlds is only $15 (for now, but even when it leaves early access, I doubt it'll be half of what Dimensions is) and should ultimately let you build, well... a LOT. Lots of potential there. I'm not sure I'd call Lego Worlds a Minecraft clone.... well, yet, anyway. Yeah, one appeal is you build stuff, but Lego Worlds may not have the survival gameplay of Minecraft. Of course, some keep asking for it in the Steam forums... but I think the developers are focused on more important additions. @rjejr About the K'Nex deal, I would normally think this would indeed prevent a Nintendo tie in, but Doctor Who building sets are licensed to Character Building. I'm not sure about the other franchises represented in the game, but in this instance the LEGO Dimensions set doesn't seem to have affected pre-existing deals. I love the Lego games but this is just way too expansive. 100€ for the base game and then they have "expansions" for another 500€ lined up already. Yeah, the pricing is clearly a big issue. It'll be interesting to see how the power of LEGO clashes with that price - which will win out? In any case, it's really 'cool' and impressive once you unpack the thing but, yep, the prices are prohibitive (especially for the packs). Friend is getting me the Scooby Doo team pack for my birthday this weekend as well. @C-Olimar - "Doctor Who building sets are licensed to Character Building"
I've never heard of Character Building, so I could easily imagine the BBC giving them the Dr Who rights for toys but adding the stipulation into the contract that they could also lincense Dr Who to other companies, and CB being happy to accept just to get the dal done. W/ K'nex I can easily imagine K'nex saying - sign a deal w/ us, no Lego for you - and Nintendo accepting that limitation. Obviously that's all speculation, but considering how wide spread Lego toys have been, and how many K'nex Mario toys I've seen, I'd say that's a fair hypothesis. Googled CB - "The Group now has offices in London, Manchester, Hong Kong and China, and employs over 230 people." @DarthNocturnal - I actually struggled to come up w/ a better word than "clone" for Lego Worlds relationship to Minecraft, knock-off, rip-off, homage, copy, nothing was working for me so I just took the simple way out and left it as clone since that was the first word that popped into my head. Whatever it is, and semantics aside, it's a very similar game. And w/ DQB coming out, I guess we must be nearing the point where "building games" just become a genre, and nto all Minecraft clones, but I dont 'think we'r ether yet. How long before 2D sidescrollers weren't all Mario clones and open world games weren't all Mario 64 clones? Now if Minecraft had been a small indie thing that nobody had heard of, maybe we could have a genre instead of clones. I still think it's funny all the "Candy Crush Saga" clones in the world, when Candy Crush is just a Bejeweled clone, but Candy Crush took the world by storm, like Minecarft. I want to play video games, not play with toys. The toys are just s way for Lego, Nintendo etc. to make as much profit as they can. Nothing wrong with profit as long as the kids parents realise they are being ripped off.